Serial communication was once the most widely used method of transferring data between computers. Many computing devices that you have used over time employ serial communication. Some of the terms associated with this type of data transfer are FTDI chip, COM interface, the RS232 protocol, and serial port. Serial communication refers to data that is electronically sent and received a single bit at a time. It forms the foundation of data transmission between personal computers. Its ease of use made it attractive to the early manufacturers of personal computers and peripheral devices. There is a good chance that your laptop does not contain a serial port. They have been largely replaced in the consumer market by the faster interfaces and connections provided by the USB standard. But serial communication is not dead yet. Many industrial and commercial processes rely on the simplicity and stability of serial communication. Industrial automation systems are becoming more prevalent and are essential to the business processes of many diverse enterprises. They operate with arrays of networked electronic devices that perform various functions in production facilities. These devices act as sensors and monitors that help control complex automated processes. Many of the components of industrial automation systems rely on serial communication to interact with each other and the computers that control them. They are designed with serial ports to facilitate their use in these automation systems. Serial applications are used to control the devices and their ability to communicate is vital to the operations of countless production lines around the world. Developers and software engineers who are tasked with implementing serial communication in embedded devices must rely on their knowledge of the protocols that form the backbone of this data transmission method. There are many serial protocols in use, but the RS232/RS422/RS485 standards are the ones most commonly used. You will find these protocols used extensively in industrial automation and embedded systems which make use of serial communication. Through the use of devices like USB to serial converters, computers that do not possess a serial port can still communicate with serial devices. There are several advantages that serial communication offers over alternative technologies such as Ethernet, USB or WiFi. While these other options may provide higher connection speed, they are not as easy to implement as serial technology. The majority of operating systems include built-in support for serial ports and the interfaces do not need to have custom drivers installed. The absence of serial ports on the current generation of laptops can be an impediment to developers who need to interact with serial devices and applications. It definitely hinders their development efforts and makes it difficult to test and troubleshoot their products. But there are hardware and software solutions that can help get around the port limitations of any Windows computer. READ Small 3-wheel ROBOT with PIC16F84 brain & InfraRed eyes. 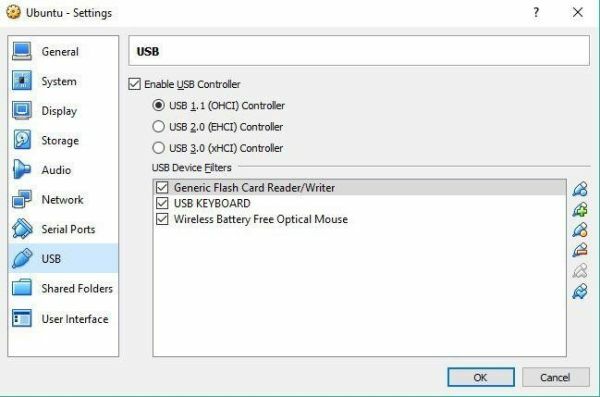 There are simple hardware devices that can be used to translate between USB and serial signals. These devices are easy to use and involve connecting one end of the converter to the USB interface on your laptop. The other end of the converter is a serial interface which can be used to connect to a serial peripheral device. That device can now operate with your laptop in the same way as if it was equipped with serial ports. A more effective solution to the lack of serial interfaces is to employ software that can create virtual serial ports which behave as if they were actual physical interfaces. This eliminates the need for additional hardware and its associated cabling. Here are two versions of a software tool that provide the user with the ability to create virtual serial ports. Serial hardware and software developers and testers will find these tools to be indispensable. The same can be said for users working with embedded devices employing serial communication. Virtual Serial Ports make it possible for computers that do not have any physical serial ports to interact with serial devices. Virtual COM ports work by sending and receiving data over a network instead of through a cabled connection with the peripheral equipment. This is accomplished by configuring the computer using specialized software. 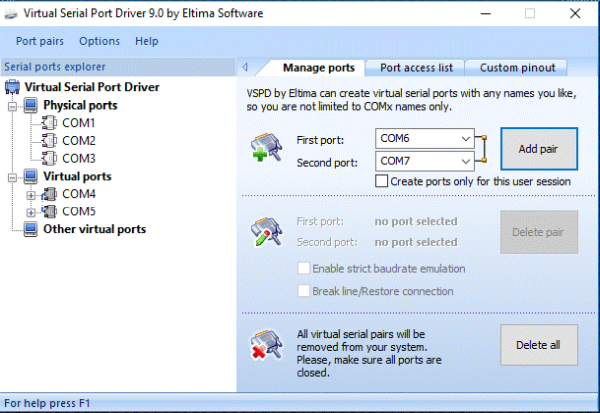 An excellent choice for creating virtual ports is Virtual Serial Port Driver (VSPD) from Eltima Software. This communication software facilitates the creation of an unlimited number of virtual serial ports. The virtual ports can be connected via a virtual null-modem cable. Every virtual interface that you create totally emulates the functionality of a physical port. VSPD makes it easy to create and manage your virtual ports and extend the utility of your serial devices. Using the software allows any machine to access network-connected serial devices despite the lack of physical interfaces. Now you can take full advantage of serial devices even if you are located on the other side of the world from them. VSPD is available in Standard and Pro versions and you can test drive both products with a 14-day trial.